When it comes to finishing stainless steel, standard mill finishes can be applied to flat rolled stainless steel through mechanical abrasives or rollers. First, the material is rolled to the desired thickness and size, followed by annealing processes to achieve the desired properties. After the desired properties have been achieved, oxidation formed on the surface will be removed (done by Pickling Processes). Next a Passivation layer is created on the surface of the stainless steel, after which final stainless steel finishes applied. Here, the corrosive resistant film on the stainless steel is not formed. While the finish is not suitable for most general uses, it does have its application in certain types of high temperature environments. Suitable for thicker plates. This finish is suitable for industrial applications with grinding marks being visible on some areas of the surface. Suitable for thicker plates. Note that the starting material of cold rolled stainless steel (for thinner plates) always has this finish, and can be finished with the standard mill finishes below. This finish is suitable for industrial applications and severe deep drawing (as the dull surface is capable of retaining the lubricant during the deep drawing process). The most common finish produced, it is given a subsequent light skin pass cold rolling operation between polished rolls. This finish is also commonly used for most of the deep drawing operations and can be more easily polished to the final desired stainless steel surface finish compared to the No. 2D finish. This surface is ultra smooth and thus less likely to harbor any moisture or airborne contaminants when compared to the other milled surfaces. This surface is also easy to clean. A ground unidirectional and uniform finish. It is achieved by using an 80 to 100 grit abrasive. Described as a good ‘starting finish’ as well as intermediate finish, it is good in cases where the stainless steel surface will require further polishing after the fabrication process has been completed. Stainless steel finishes achieved here are categorized as satin. This finish is created by applying rotating cloth mops loaded with abrasive paste. The surface finished achieved will depend on the abrasive used, as well as the finish and uniformity of the original surface. An example of this type of finish is Satin Blend, which has a non-directional reflectiveness. Buffed, this finish has a degree of reflectiveness, however some fine grit lines may remain from the original starting stainless steel surface. This finish is achieved by progressively using finer and finer abrasives and finishing containing buffer compounds. A bead blasted surface finish. This is a heat controlled, finish-wide range of heat colored and electropolished surfaces. This is a uniform, uni-directional finish with a low reflectivity. It has a coarse finish, restricting its use to internal applications. The visual appearance of the stainless steel surface finish will depend on the both the material and the roughness of the grinding belt. Achieved by using brushes or polishing belts, it is a uni-directional surface finish that is non-reflective and suitable for use in internal architectural applications. Achieved by using brushes or finger grit belts, a clean cut finish is produced with a maximum roughness of Ra=0.5 microns. Because it has a smooth and reflective surface, it is suitable for use in architectural applications, especially exterior applications where atmospheric performance is important. Achieved by polishing and buffing with special polishing compounds and soft cloth mops, the result is a highly reflective, ultra-smooth appearance. Here the material is annealed, pickled and skin passed on bead blasted rolls n order to achieve a low reflective and dull finish on both sides of the sheet material. This is a aesthetically pleasing surfaces that are textured on only one side of the material. It is typically used in architectural applications. These rolled and pressed patterns are manufactured on female and male dies and rolls. The result is a two sided textured surface finish. 2M – A one sided pattern where the reverse side is plain. 2W – A two sided pattern where the pattern is also imprinted on the reverse side. This process is able to provide stainless steel finishes that are uniform, non-directional and low-reflective. These surfaces also contrast visually well with highly polished surfaces. The appearance of the finished surface can be altered by altering the blast material. This stainless steel finishing process is suited for both sheet and intricately shaped components. This process is used in order to enhance reflectivity as well as the smoothness of the surface. Notes that the end finish here will depend on the finish on the initial stainless steel component. This finishing method facilitates the ease of maintenance as well as enhances the stainless steel’s appearance. Read more about Electropolishing. The oxide layer at the surface of stainless steel is capable of repairing itself in the presence of oxygen. This layer can also be colored by applying chemical processes, followed by hardening through electrolytic processes. For this process, austenitic stainless steel is well suited. Depending on the time in which the stainless steel is immersed in the solution, the film on the surface is built up and, through the physical effect of light interference, intense colors effects are achieved. The range of colors that passes through: Green, bronze, blue, red, gold and purple. This corresponds to the increase in the film thickness from 0.02 microns to 0.36 microns. Because the oxide layer is not susceptible to bleaching by ultraviolet light and the coloring process by no means involve pigments, stainless steel fabrication processes can be performed after coloring without the occurrence of film cracking. In stainless steel tube bending, the film produced will stretch with the bend, causing a thinning of the film and thus a marginally reduced color depth. This process is capable of delivering a permanent color that requires no restoration like that seen with painted finishes. Also note that, for example, a post coloring dull surface finish will result in a dull color, and a mirror polish surface finish will result in a highly reflective color. Black also includes one of the colored stainless steel finishes available. This is achieved by using a special solution that includes sodium dichromate. Read more about Blackening here . This is achieved by texturing the stainless steel component before coloring processes are applied. Further enhancement of these designs are achieved by simply grinding off the high points of the pattern, thus effectively exposing the stainless self-color. This leaves the applied color in the recess, thus making it less vulnerable to damage. These types of coatings are available to clients on flat rolled stainless steel, either in the form of primers, or primers plus top coats in Acrylic and PVF2. By specialist pre-treatments and coatings, manufacturers are able to create a basis for maximum adherence as well as a stable service life for the coating. Primer coatings, which are applied to the reverse sides of patterned and polished stainless steel sheets, is capable of facilitating bonding to other materials. Seam welding can also be performed on stainless steel roof sheeting by included stainless steel powder at the point where the material is to be welded. Specialist companies are capable of providing dynamic graphic designs with processes that included shot blasting, coloring, acid etching, photoresist processes, grinding and polishing. 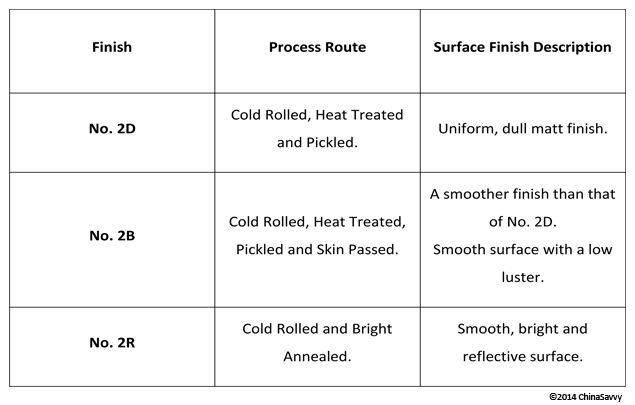 Using either one or a combination of these stainless steel finishing processes, specialist companies will use Masking (to protect the surface) during finishing processes. Photoresist and Silk Screen processes are used in order to transfer a pattern onto the surface of the stainless steel. The surface is then acid etched and reveals the pattern. Acid etching involves the removal of small amounts of surface material and electro-chemical coloring can also be performed before or even after etching. A stainless steel surface finish is commonly applied in order to ensure the maintenance of the surface as well as to deliver the desired aesthetic characteristics. All stainless steel surfaces need to be degreased, cleaned and finished after undergoing a fabrication process that alters the condition of the the surface. In cases where a highly polished surface is not a part of the desired finish requirements, Blackening is applied. This involves the production of a non-reflective, black oxide surface. Immersion in a sulphuric acid and potassium dichromate solution. Surface colors can be done on stainless steel surfaces for architectural applications. Coloring of stainless steel surfaces are done by a propriety process which involves the immersing the work piece in a hot chromic/sulphuric acid solution. After immersion, the process is followed by another acidic solution treatment – cathodic hardening. In this treatment, the base materials react with the hot acid, resulting in the formation of a transparent film. Initially, this film is colorless, but light interference imparts a color to the layer. If the stainless steel’s surface is highly polished prior to coloring, the result will be a strong metallic luster, while satin and matt finished stainless steel will result in a matt finish. Colors achievable: Black, bronze, red, gold, blue, purple and green, including a variety of different shades. An electrochemical process applied in order to remove the peaks of the rough surfaces of metal, electropolishing is capable of smoothing the surface of the stainless steel, thus giving it a brighter appearance. Finishing stainless steel in the manner results in a finish that is resistant to corrosion, aesthetically pleasing and hygienic. This stainless steel surface finish can also appear ‘frosted’ on some types of stainless steel. With the capability of being readily polished and ground after standard techniques have been modified, stainless steel surfaces, due to high strength, do tend to have a build up of material on abrasive media. Because of stainless steel’s low thermal conductivity, heat is also accumulated, resulting in what is called heat tinting on the surface. Complications can be alleviated by simply using low feed and grinding speeds combined with a specific set of lubricants (matching the needs and requirements of the stainless steel surface) and grinding medias. Note that all polishing processes must be done is such a way as to avoid iron based material contamination. Vibratory finishing and barrel finishing will often be used in order to polish small parts and stainless steel fittings. When sand blasting is done, a clean silica or garnet sand must be used, and in cases where grit, shot and cur wire blasting is performed. A stainless steel media with an equal or greater resistance to corrosion (compared to the stainless steel surface being finished) must be used. While light heat tint can be removed by using wire brushing, it is vital that these brushes are stainless steel, clean and never used on any other materials. Keep in mind that stainless steel finishing of this kind is not resistant to corrosion as this process does not remove all of the chromium depleted materials. Mechanical Polishing will often be done prior to Pickling processes. Used in order to remove any free iron contamination, Passivation is an effective measure for removing non-stainless steel alloys (such as cast iron, mild steel, elemental iron and carbon steel) that can cause complications. This process involves the treatment of the surface with a nitric acid, or nitric acid and sodium dichromate combination. Normally deposited as a result of fabrication tools or the work surface during the stainless steel fabrication process, iron particles encourages surface corrosion, and discoloration. Furthermore, it can cause more serious problems such as isolated pitting corrosion. Using an acid or acidic mixture, pickling involves the removal of scale produced during high temperature fabrication processes, such as welding, hot working and heat treatments. This process is performed by using Pickling Paste or baths. Pickling Paste, a stiff paste made of strong acids, is applied to overhanging or vertical surfaces and can also be used to remove post-weld discoloration, delivering desired stainless steel finishes.